A world without water would be dry and dead. Water is essential for life! In the Bible, water is used as a symbolism for various things such as salvation, cleansing, the Holy Spirit, and more. 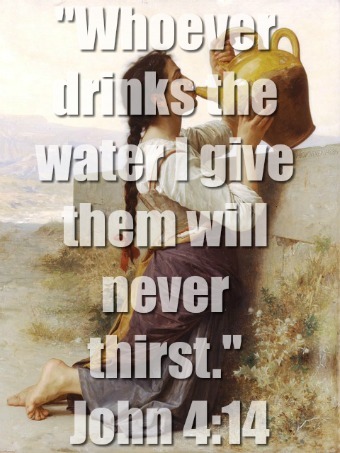 The water that Jesus offers will never leave you thirsty. This world promises us peace, joy, and satisfaction, but it never lives up to the promises. We end up more broken than ever before. The wells of this world leave us thirsty desiring more. Nothing can compare to the water that Jesus offers us. Has your self-worth been coming from the world lately? If so, it’s time to look to Christ who offers life in abundance. That thirst and that desire for more will be quenched by His Spirit. This passage is beautiful. Hagar was not blind, but God opened her eyes and He allowed her to see a well that she didn’t see before. It was all by His grace. It’s beautiful and joyous when our eyes are opened by the Spirit. Notice that the first thing that Hagar saw was a well of water. God opens our eyes to see the well of living water. 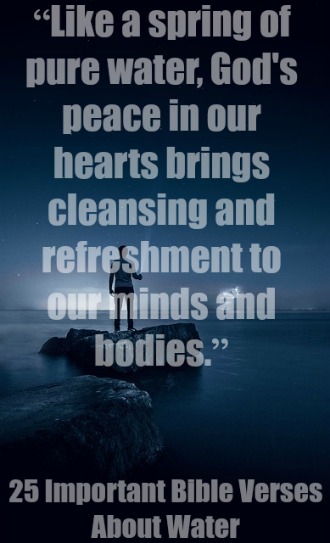 With this water our souls are filled. God will abundantly satisfy all of our needs. He is a faithful Shepherd that leads His flock to places where they will be spiritually satisfied. In these verses we see God’s goodness and the peace and joy that the Spirit brings. God greatly provides and enriches His creation. Do you want to know Him more? Do you want to experience His presence in a way that you have never experienced before? Is there a hunger and thirst in your heart that is not satisfied by anything else? There is in mine. I have to continually seek Him and cry out for more of Him. In John 3:5 Jesus said to Nicodemus, “Except a man be born of water and of the Spirit, he cannot enter into the Kingdom of God.” Contrary to popular belief, this verse is not referring to water baptism. Water in this passage is referring to spiritual cleansing from the Holy Spirit when someone gets saved. Those who put their trust in the blood of Christ will be made new by the regenerative work of the Holy Spirit. We see this in Ezekiel 36. The washing of water by the word. We know that baptism does not cleanse us so Ephesians 5:26 can’t be referring to water baptism. The water of the Word purifies us by the truth that we find in the Scriptures. The blood of Jesus Christ cleanses us from the guilt and power of sin.